The North Carolina Association of Educators is endorsing Attorney General Roy Cooper for governor. The North Carolina Association of Educators (NCAE) is endorsing Attorney General Roy Cooper for governor. The state's largest teachers' group gave its endorsement to Cooper, a Democrat, before the end of the candidate filing period. NCAE President Rodney Ellis said the group interviewed candidates, including Republican Governor Pat McCrory, and decided to support Cooper because of his goals of raising teacher pay and per-pupil spending. "His beliefs and values about public education reflect ours," Ellis said during a press conference at NCAE headquarters in Raleigh. Cooper said at the conference the state can afford to increase education spending by reducing tax breaks for corporations. "They've said the money's not there, but it has been," he said. "It's a question of priorities." Cooper said despite partisanship, there's support on both sides of the aisle to increase education funding. He told reporters that as governor he could rally both grassroots support and the support of the business community to do so. "[Business leaders] will put pressure on the legislature to get this done if they have the right leadership and if they have someone in the executive office in North Carolina who really cares about this issue and doesn't just give it lip-service," Cooper said. With support from McCrory, lawmakers raised beginning teacher salaries to $35,000 this year, moving the state from 46th to 42nd in the nation in average teacher pay, according to estimates from the National Association of Educators. But the state still has the lowest per-pupil spending in the Southeast. NCAE Vice President Mark Jewell said putting Cooper in the governor's seat would help the teacher's organization navigate the Republican supermajority in the General Assembly. "If we get a governor who can be our goalie, like Attorney General Cooper, and if we can pick up some seats in the House and the Senate, then the governor can veto some of this bad legislation, and [lawmakers] will be forced to negotiate," Jewell said. In response to the NCAE endorsement, McCrory's campaign director Billy Constangy said in an email that the campaign would rather have the support of teachers themselves than the NCAE. This article was originally published Dec. 9, 2015. 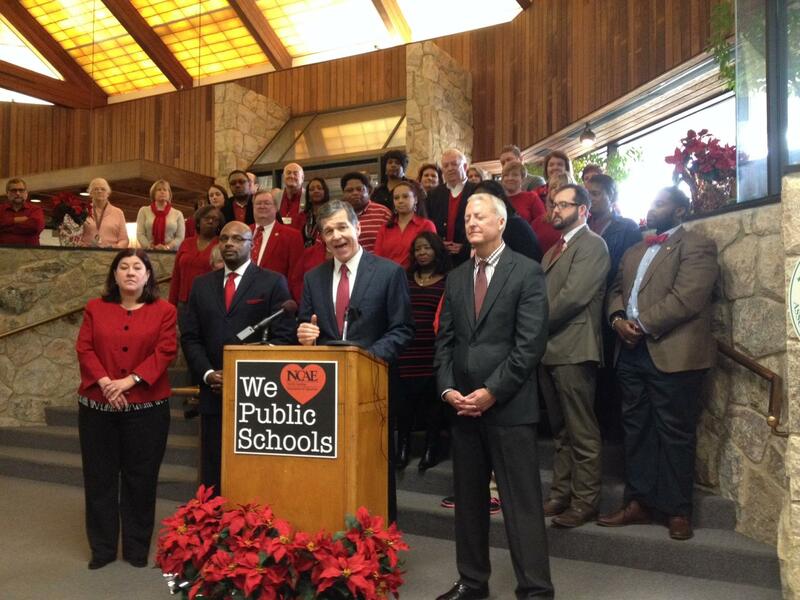 It was updated Dec. 10 to include a response to the NCAE's endorsement by McCrory's campaign director Billly Constangy. North Carolina Attorney General Roy Cooper announced his run for the democratic nomination for governor last night in Rocky Mount. Cooper’s announcement was no surprise. The attorney general has been open about his desire to run since at least 2013. He took the stage at Nash County Community College near his hometown of Nashville, in eastern North Carolina.